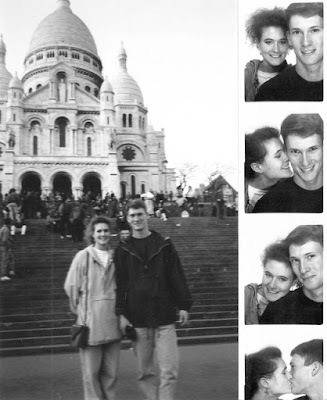 Can you believe this is me & Eric in Paris, 18+ years ago? Look at that crazy, looooong hair of mine. 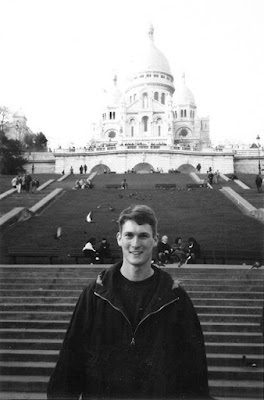 And look at that baby face of Eric's. He's always looked so young. Even now. And my God, why are our jackets so large? We could smuggle 15 baguettes under those tents. Why am I posting a photo of us in Paris? Because I'd like to go back. Someday. 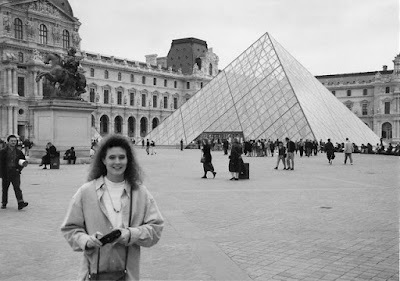 And one of my favorite blogs - Oh Happy Day - is giving away a trip for two to Paris! Not that I want you to go online and register to win too, because that would make my odds for winning even worse. But if I post their contest on my blog, then I'm entered to win. Oh, OK... go ahead and register, but if you win, I don't want to hear about it. I also remember how to order a ham & cheese sandwich: Je voudrais une sandwich jambon et de fromage. Four years of French class. I've still got it. Sorta. By the way, you should seriously check out Oh Happy Day. It's full of all kinds of fun ideas and inspiration. Me in front of Pei's Pyramid at the Louvre. Eric in front of Sacre Coeur. You are the sweet to my salty.